Much like a backsplash, adding or replacing countertops in your kitchen (or bathroom) can make an enormous style change in either a total kitchen or bath renovation or simply just replacing the countertops of your kitchen! When choosing your countertops, it is best to talk with Artisan Construction about the kinds of activities that take place in the kitchen and what surface might be the best fit for your purposes. This is a one in a million look. No one else will have the look that your countertop has. As a homeowner, you also have to be aware that concrete will have its own stains and react to acids differently. Don’t forget to wax and seal your granite to maintain your concrete. Although a more upscale finish, Slate is sensitive to lime and acid stains. Special precautions need to be taken when choosing a slate countertop. Beautiful and durable, granite is the element of choice for many homeowners replacing or remodeling countertops. Due to the very nature of the marbling colors and designs, granite has a tendency to be a little wild. At Artisan Construction we recommend editing the rest of the project, like the backsplash or cabinet color should a homeowner choose a granite countertop application. A larger countertop can pose a few more challenges from a design perspective with matching seems. 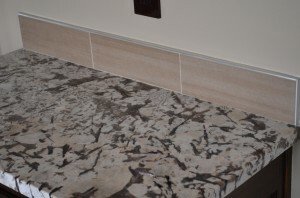 Cleaning, sealing and repairing the seams in your granite are maintenance issues to consider. Formica is making a comeback! With the bull nose, wood or metal edgings and the patterns that are available, Formica is again a countertop choice to be considered. 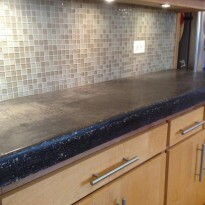 Homeowners can even choose Formica that looks like granite! A great choice for budgeting considerations! Choosing a new countertop for your kitchen or your bathroom and hiring the right professional to get the job done will either make your project easier or harder. Artisan Construction pays attention to the details and works with other skilled craftsman deliver a perfect project everytime. Contact or call (816)797-4346 today for an artist’s touch for your kitchen countertops and all your remodeling projects!